Herpes simplex esophagitis is usually encountered in immunocompromised hosts. This case is from a renal transplant recipient. Some cases occur in immunocompetent individuals. Symptomatic patients present with odynophagia, chest pain, and fever. 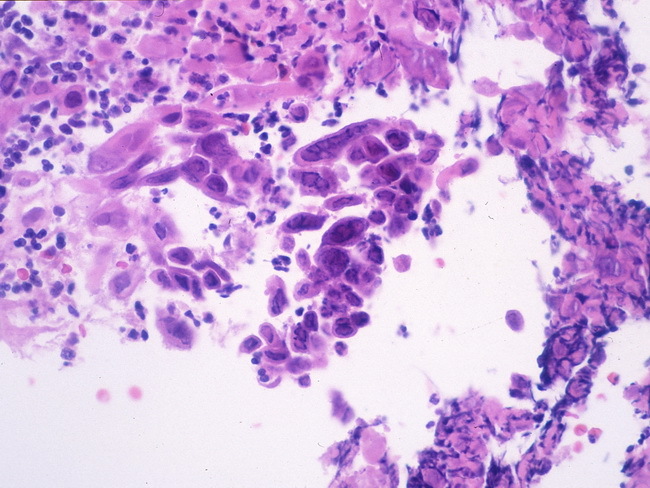 This esophageal biopsy shows acute inflammation, ulceration, and Cowdry type A inclusions. The viral inclusions are pink to purple and contain intact and fragmented virions.